Small Animal Talk: Why do dogs get old and can we do anything about it? Why do dogs get old and can we do anything about it? Drs Daniel Promislow and Matt Kaeberlein study aging in dogs. What if there was some way to ensure dogs lived longer? Something to delay the onset of old age? 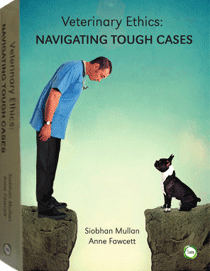 Canine mortality is a topic I reflect on daily – as both a veterinarian and owner of a senior dog. I know it is likely (excluding something unexpected) that I will outlive Phil, a thought that makes my heart sink. The other thought that makes my heart sink is that he will likely experience all of those issues related to age – degenerative joint disease, potentially cognitive decline, and chronic diseases that can impact on his quality of life. Scholars involved in The Dog Aging Project, run through the University of Washington’s Healthy Aging and Longevity ResearchInstitute, are actively seeking information that may help extend the lifespan of our companions. The Dog Aging Project involves two major studies. The first is a longitudinal study of dog aging. The second is an intervention trial, treating middle-aged dogs with the drug rapamycin. This drug is currently used in human patients as an anti-cancer and anti-transplant-rejection agent. Studies have found that low doses of this agent may slow aging and extend the lifespan in several organisms. Project leaders Drs Daniel Promislow and Matt Kaeberlein spoke to SAT about aging in dogs. MK: I think a good definition of ‘geroscience’ is the study of the basic biological mechanisms of aging. This is different from ‘geriatrics’ which is more the study of old age and clinical treatment for the elderly. How did the Dog Aging Project come about? DP: I started working on aging as a graduate student at the University of Oxford in the late 1980’s. For part of my thesis, I used published studies to compare mortality patterns across species of mammals, from mice and voles to elephants. We have known for a very long time that larger species live longer than smaller ones. I was interested in understanding why, within a particular size class, some species are longer-lived than others. Fast-forward more than 25 years, to 2007. A paper from Elaine Ostrander’s group at NIH appeared in Science, showing that size in breeds is due in large part to variation at a single gene, IGF1. (The cover of this issue of Science had a Great Dane walking next to a Chihuahua—you might have seen it). This got me thinking about dogs for two reasons. First, IGF1 has been associated with lifespan in mice. And second, it reminded me that in dogs, large breeds are shorter-lived than small breeds, counter to the pattern that we see across species of mammals. I wondered if IGF1 might have something to do with this pattern. My colleague Steve Austad had mentioned that he had access to a large dataset, the Veterinary Medical Database (VMDB), which included information for >80,000 dogs on breed-specific age and cause of death. I was able to obtain those data, and began a collaboration with my colleague Dr. Kate Creevy, DVM at the University of Georgia (see papers by Fleming et al, and Hoffman et al.). This led to a program officer at the National Institute on Aging at NIH asking if I would be interested in writing a grant to create a network of scientists interested in dog aging. This led to my obtaining an R24 grant from NIH to fund the Canine Longevity Consortium. The goal of this consortium is to create a long-term study of the genetic and environmental determinants of healthy aging in companion dogs. After 18 years at the University of Georgia, in the summer of 2015, I joined the Departments of Biology and Pathology at the University of Washington. My colleague, Matt Kaeberlein, who is director of the Healthy Aging and Longevity Institute, was very excited about the idea that we could learn a lot about aging by studying dogs. Matt had the idea of looking at the effects of Rapamycin in dogs, which has been shown to improve heart function in mice. 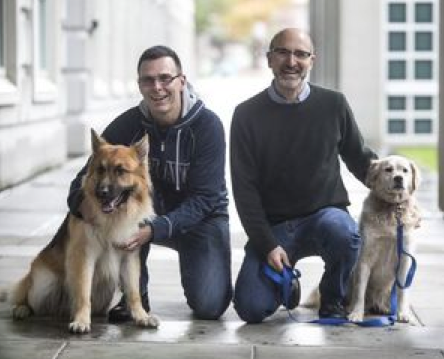 Matt and I, along with my colleague Dr. Creevy and also Adam Boyko from Cornell Vet School, are now putting together plans for a nationwide long-term longitudinal study of aging in dogs. Dr Promislow with Dr Kate Creevy, and canine companions. MK: The project really evolved from a long-term interest that Daniel has had in dog evolution and aging and my long-term interest in the basic biology of aging and, in particular, translational approaches to take what we’ve learned in the lab and improve the quality of life for people. I’ve also always had dogs, and we were able to recruit Daniel came to the UW a couple of years ago, we quickly found that we both were excited about the possibility of actually doing something important to understand aging in dogs and, hopefully, to give dogs longer healthier lives. Big picture - our goals are to (1) improve the length and quality of life for dogs by slowing the biological aging process and (2) eventually contribute to the use of this information for similar outcomes in people. I view these as completely complementary goals each with their own intrinsic value. There are two primary approaches we are taking. The first is a longitudinal study of aging in which we hope to enroll >10,000 dogs (Daniel’s goal is ultimately 100,000) and follow them throughout life to understand the key genetic and environmental factors that determine why some dogs age well and others don’t. The second major component of the Dog Aging Project are intervention studies to promote healthy longevity in dogs. The current ongoing study is a short term rapamycin trial to establish appropriate dosing for a longer-term (3-5 year) study hopefully to start in 2016. A secondary goal of the current study is to determine whether 10 weeks of rapamycin treatment improves age-associated cardiac decline in dogs, as has been seen in mice. MK: There are many levels of answers to this question. One answer is because evolution has no use for us once we’ve passed our genes on to the next generation, and so aging is in some ways what happens in the absence of natural selection to keep a biological system functioning optimally. At the molecular level, we’ve learned about some of the key processes that contribute to cellular aging. Not surprisingly, it’s complicated and there isn’t any one thing we can point to and say it’s the single molecular cause of aging, despite what you will sometimes read in the popular press. A relatively recent review on this identified 7 hallmarks of aging, which I think does an ok job of summarizing key molecular processes that contribute to age-related declines. I think it’s important to keep in mind, however, that even though we don’t completely understand aging at a molecular level (and perhaps never will), we do know about single genes or individual environmental factors that influence the rate of aging. By altering these factors, we can make an animal age faster or slower, at least in laboratory studies. For example, treating mice with the drug we are studying in dogs (rapamycin) can extend lifespan by up to 25-30% and delay multiple age-associated disorders including cognitive decline, cancer, cardiac decline, and immune decline. Why do some dogs seem to age much faster than others? (For example, giant breeds are classified as geriatric often from age 4-6, whereas some small breed dogs live well into their teens). MK: That’s one of the key questions we hope to answer in the longitudinal study of aging. For now, the only thing that has really been implicated is signalling through the IGF-1 pathway, which we know from laboratory studies affects aging in lots of different organisms. Larger dogs have higher IGF-1 signalling in general and larger dogs age faster than smaller dogs. Purebred dogs have shorter lifespans than mixed breed dogs, although that is unlikely to reflect a difference in the rate of aging, as opposed to increased risk of specific abnormalities due to inbreeding. There is also still some question as to whether fixed [desexed] versus intact [not desexed] animals age differently. Daniel has published on this question, and the answer seems to be that there are differences in causes of death and disease incidence in fixed and intact animals, but the overall effect of reproductive status on mortality is relatively small. DP: We still don’t know, but we have some clues. Breeds differ quite dramatically in what they die of (see, for example, the Fleming et al. paper, where we describe causes of death in scores of breeds). Risks of mortality increase with age in all dogs, but what those risks are varies. Perhaps the clearest pattern we see is that large dogs are more prone to die of cancer. But there are some exceptions, with some small breeds prone to cancer. While we can certainly speculate about why large dogs are more prone to die of cancer, and at earlier ages, we don’t have solid evidence yet. We have also shown that large dogs don’t just have higher mortality rates. They do, in fact, appear to age faster (Kraus et al. American Naturalist). Why is this research being conducted in dogs as opposed to cats or horses? MK: Aside from the fact that I’m a dog person, there were a few important factors that make dogs a better choice at this point for this kind of study. One is that mid-to-large size dogs have lifespans that are amenable to both longitudinal and intervention studies of aging. In the case of the rapamycin trial, we can know within 3-5 years the extent to which the drug is delaying aging and diseases of aging in dogs who start the treatment after 6 years of age, for example. Another is that dogs have a well-characterized and diverse genetic structure with many purebred lines as well as mixed breeds. Another is that the medication in the intervention trial is being given as a pill and it’s easier to give a dog a pill than it is a cat. [Ah, you have not met Phil – ed]. DP: There are many good reasons to study aging in dogs. Dogs are perhaps the most phenotypically variable species on the planet. And this variability includes not only size, shape, color, and behavior, but also rates and causes of mortality. This variability is much greater than in cats or horses. Breeds are very distinct among dogs. In many cases in cats, it is harder to clearly distinguish some breeds. Sadly, dogs are shorter-lived than cats, and much shorter lived than horses. We can complete studies of many breeds, from birth to death, in less than a decade. This would not be possible in cats, and certainly not in horses. It is often said that “age itself is not a disease”, yet many humans and animals die when they’re old. Is old age be a cause of death? MK: Whether we die from aging or specific diseases and whether aging itself is a disease is (in my opinion at least) a semantic argument. Aging is the most important cause of the vast majority of diseases that people die from/with. What most people fail to realize is that age is the single greatest risk factor for every major cause of mortality in developed countries. If you simply consider the increase in risk of dying from any of the major killers (Alzheimer’s disease, heart disease, cancer, diabetes, kidney disease, stroke, …) over any 20 year period of life after 40, it dwarfs the increase in risk associated with diet, genetics, alcohol consumption, and activity combined. My opinion is that we need to understand what it is about the aging process that causes this increase in disease and disability risk, if we really want to have a significant impact on quality of life for older dogs and their owners. Likewise, the impact of slowing aging on health and life expectancy is much greater than the impact of curing individual diseases. Are they are proven methods to prevent, delay, or reverse aging? MK: Yes, in laboratory animals. Caloric restriction and rapamycin are the two that have been best documented in organisms from very simple (yeast, worms, fruit flies) to closer to humans (mice mostly), but there are several others that have been shown to increase lifespan in one or more systems and are under further study. Rapamycin is particularly interesting because, at least for cardiac and immune function, it seems to be able to partially reverse age-related declines in function. Are there potential negatives for living longer – for example, would owning pets longer mean there are less vacancies in good homes for adopted animals? MK: This question also gets asked in the context of human aging. If we slow aging in people will this create problems for society… I think it’s important to consider the effects that longer lifespans would have for people and pets, but I don’t think we can really predict what the outcome of healthier aging will be in either case. DP: Our goal is to understand how to improve healthy aging. We want to maximize the quality of life of our older dogs. This doesn’t necessarily mean we will have more older dogs, but we certainly hope to have healthier older dogs. Millions of dogs are euthanized every year in animal shelters. There is no doubt that reducing this number is an important goal. It is a goal that should go hand in hand with the goal of improving the quality of life of our oldest dogs. Do you think that science will one day work out how to render humans and other animals immortal? MK: Maybe someday, but not any time soon. I think it’s likely that 25% gains in longevity are possible in the relatively near future. For dogs, that could be as soon as 5-10 years from now, if sufficient funding were put toward the problem. For people it would obviously take longer to test and document those gains. Your site shows canine citizen scientists. How can other dogs and humans contribute to knowledge in this area? MK: By participating in our study or in other studies like the Golden Retriever Lifetime Study! Once we have funding to begin the Longitudinal Study of Aging, we will be recruiting several thousand dogs into the study, so there will be lots of opportunities to participate. Aside from that, two things that owners can do to facilitate progress in this area are to support increased funding for this type of research and, if they have the means, donate to support the research. Have your own experiences with dogs (particularly losing dogs) influenced your interest to work in this area? MK: Absolutely. With the exception of a few years when I first moved out of my parents’ home, I have always had at least one dog. I love dogs and this project is a great mix of my professional passion and something I care about deeply in my personal life. In your view, what else can we do to make the world a better place for non-human animals? MK: Education probably. I think attitudes toward animals have generally changed for the better in the United States and other developed nations in the past few decades. Hopefully that will continue.